*Status of subspecies is unclear. Pelage: Spotted pattern in rosettes, with smaller spots inside. Range: Mexico through Central America, South America; a few individuals live in U.S. southwest. Habitat: Dense lowland and montane tropical forests; often near water, though highly adaptable to drier habitats. Population in Wild: About 173,000 individuals. Most numerous in Brazil and Peru. Locomotion: 50 cm (19.7 in) strides; run top sped (100 km/hr or 62 mph) short distance. Activity Cycle: Primarily hunt at night; varies locally. Social Groups: Solitary except when mating or female caring for young. Diet: Some 85 species; including capybara, marsh deer, giant anteater, red brocket deer; turtles, fish, birds, and alligator. Largest and most robust cat of Americas; circumference of massive head usually greater than height at shoulder. At SD Zoo, Nindiri gave birth to a male cub, Valerio, in March of 2015. © 2008-2018 San Diego Zoo Global. Taxonomy and population estimates updated Oct 2018. 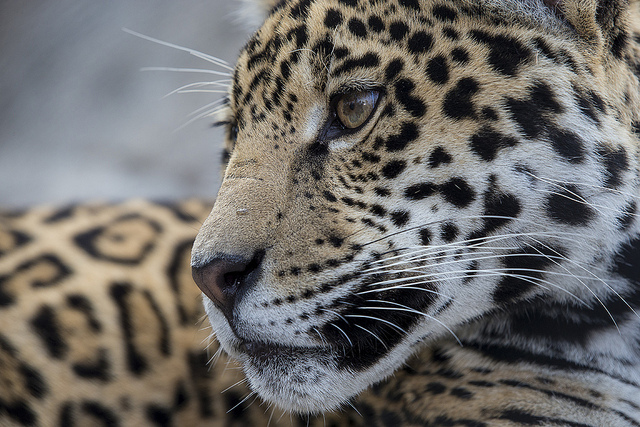 How to cite: Jaguar (Panthera onca) Fact Sheet. © 2008-2018. San Diego (CA): San Diego Zoo Global; [accessed YYYY Mmm dd]. http://ielc.libguides.com/sdzg/factsheets/ jaguar.